Maya is indeed powerful; but God is more powerful than Maya. Take refuge in God. Then there is no Maya for you. The pictorial presentation was originally mooted by Dr. Vivek Nayar, Ireland. Further, that developed into this present form by the united efforts of the children of Divine Mother. You will find the book very absorbing, elevating, and divinely vibrant. For, Divine Mothers life is a veritable glow of all that is glorious and auspicious  the hoary and eternal culture of our Bharath. She stands peerless in Her matchless splendour of secular and Divine excellences. In the laboratory of Her life She combined the essence of all vedas, shastras and puranas and brought out the Divine nectar (Amrut Kumbha) to be tasted by the Mankind for all times to come. As Supreme Shakthi, She knows the problems of whole humanity. Her words, bhavas, and even Her remembrance are imbued with Divine Power. She has transformed thousands by mere look, gestures, words and silence. Her pictures are not mere forms but radiating sources of Divine Power. 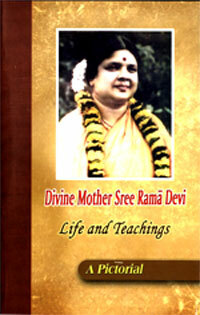 Hence, the whole book in its entirety is radiant with Divine Power which you will experience when you scan the book.